I was jinxed with this one! I truly was - not with regards to the recipe but with regards to finding time to actually complete it. The month has been so busy Phew! Every time I alloted time to start the challenge something would get in the way. And I was so excited to tackle this great challenge. The challenge was from the truly wonderful and close to my heart Tanna of My Kitchen in Half Cups. It was as if Tanna had managed to look into the deep realm of my brain and picked out the one thing that has been on my mind a lot lately. Bread - and bread baking! I live in Germany where good bread is plentiful. I have even been doing an interesting German bread series on The Daily Tiffin, where I have shown the several different varieties my baker offers. So, I have never really found the need to actually bake my own bread. But as I did the "Inside a German Bakery" series, I was more and more intrigued by bread baking. I just did not actually dare to make my own! Hey, and being a Daring Baker does not mean you magically are relived of all your fears. Ohhhh noooo! You still have them - but what the Daring Baker group really does to you is make you confront your fears, challenge yourself and, in my opinion the best part of this group, motivate, cheer and help you along each step of the way. So, as I said when Tanna chose a Tender Potato Bread from Home Baking: The Artful Mix of Flour and Traditions from Around the World by Jeffrey Alford and Naomi Duguid, I was at first fearful but the optimist in me was quite ecstatic. Especially as one of the variations we were allowed to make was a focaccia. It's something I was recently looking into and Tanna's magical powers pulled the idea out of my head, put it through her trick box and turned it into reality. It was time to knead bread! At the time I was emailing Hilda of Saffron and Blueberry and discussed the prospect of doing it together, but both our schedules did not seem to match and as the days sped past I was finding myself with less and less time. Hilda finally did manage to finish her challenge ahead of me and gave me a few helpful tips. All I needed was a day with ohhhh - approximately 72 hours and I was in business. I finally thought of making the dough the night before and then doing it the next morning and once again the folks over at our DB blog were great with ideas, help and advice. In the end I did manage to complete the challenge all in one day. It was brilliant, soothing and incredible. I was kind of irritated the day I chose to make the bread - but take it from me, on such days, folks, forget your shrink - just bake bread! I kneaded the bread, slapped it around, punched it and knuckled it back and forth. It was awesome. In the end I was rewarded with a soft, tender, moist crumb so wonderfully aromatic it was heavenly. The recipe was to be followed to the "T" until we get to shaping the bread. The bread had to be savory and not sweet. We could not use a biga, sponge, or starter method. We could shape the dough anyway we liked: as a loaf, as rolls, as focaccia. We could season the bread in any way we wanted. I was thankful that after the few previous sweet Daring Baker challenges we were getting to go savory again. I also got to use my new measurement utensils I bought from Dubai. Together with my new digital weighing scale that gives me the weights in grams/kilos and ounces/pounds, I am armed for any future challenges!! Note: For the beginner bread baker it is suggested to use no more than 8 ounces of potato; for the more advanced no more than 16 ounces. I used approximately 9 ounces, which did not make the dough as sticky as it probably would have if I had used more. Drain the potatoes, reserving the potato water, and mash the potatoes well. Tanna had suggested using a food mill for this, I always use my mill to make mashed potatoes as it gives the smoothest results. So, I too would suggest this. Measure out 3 cups (750ml) of the reserved potato water. Add extra water if needed to make 3 cups. Place the water and mashed potatoes in the bowl you plan to mix the bread dough in. Let cool to lukewarm (70-80°F/21 - 29°C) – stir well before testing the temperature – it should feel barely warm to your hand. You should be able to submerge you hand in the mix and not be uncomfortable. Add yeast to 2 cups all-purpose flour and whisk. Add yeast and flour to the cooled mashed potatoes and water and mix well. Allow to rest/sit 5 minutes. Note about adding yeast: If using active dry yeast or fresh yeast, mix and stir yeast into cooled water and mashed potatoes and water and let stand 5 minutes. Then add 2 cups of flour to the yeast mix and allow to rest several minutes. If using instant dry yeast, add yeast to 2 cups all-purpose flour and whisk. Add yeast and flour to the cooled mashed potatoes and water and mix well. Allow to rest/sit 5 minutes. I used instant dry yeast and simply whisked it into my flour. Sprinkle in the remaining 1 tablespoon salt and the softened butter; mix well. Add the 1 cup whole wheat flour, stir briefly. Add 2 cups of the unbleached all-purpose flour and stir until all the flour has been incorporated. At this point 4 cups of the possible 8 ½ cups as suggested by the recipe have been used. Turn the dough out onto a generously floured surface and knead for about 10 minutes, incorporating flour as needed to prevent sticking. The dough was very sticky to begin with, but as it takes up more flour from the kneading surface, it becomes easier to handle. Scrape the dough off the surface using a scraper. Keep adding flour until you feel the dough has the right texture. I personally only needed a little over 6 cups. The kneaded dough will still be very soft and moist, but don't worry, leaving it on parchment or wax paper to proof and to bake makes it easier to handle. Place the dough in a large clean bowl and cover with plastic wrap or lid. Allow to rise for about 2 hours or until doubled in volume. Flour the surface generously and then turn the dough out onto the surface. Knead gently for several minutes. It will be moist and still a little sticky. 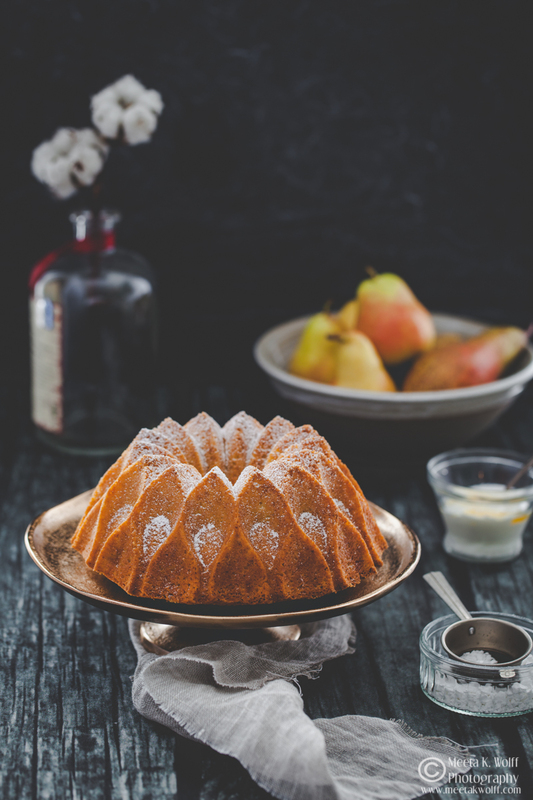 Butter a 13 x 9 inch sheet cake pan or a shallow cake pan. Cut the dough into 6 equal pieces. Shape each into a ball under the palm of your floured hand and place on the baking sheet, leaving 1/2 inch between the balls. Cover with plastic wrap and let rise for about 35 minutes, until puffy and almost doubled. Flatten out the dough to a rectangle about 10 x 15 inches with your palms and fingertips. Tear off a piece of parchment paper or wax paper a little longer than the dough and dust it generously with flour. Transfer the focaccia to the paper. Brush the top of the dough generously with olive oil and topping (please see below). Cover with plastic and let rise for 20 minutes. Note about baking order: Bake the focaccia before you bake rolls. Brush the tops of the rolls with a little melted butter or olive oil (the butter will give a golden/browned crust). Slash the rolls crosswise two or three times with a razor blade or very sharp knife and immediately place on baking sheet in the oven. Just before placing the rolls in the oven, I sprinkled my rolls with a few black cumin seeds to give a delicious aromatic flavor. Believe me, the fragrance that lingered in the kitchen was simply gorgeous! Transfer the rolls to a rack when done to cool. Place a no edged baking/sheet (you want to be able to slide the shaped dough on the parchment paper onto the baking sheet and an edge complicates things). Place the baking sheet on a rack in the center of the oven and preheat to 450°F/230°C. Just before baking, dimple the focaccia all over again with your fingertips. Leaving it on the paper, transfer to the hot baking sheet. Bake until golden, about 10-12 minutes. Transfer to a rack (remove paper) and let cool at least 10 minutes before serving. My topping consisted of some lovely roasted Piquillo Peppers, black olives, basil and coarse sea salt. Simply layer the topping on the focaccia before allowing it to rest for 20 minutes (see above). After the focaccia has rested, dimple bread again and bake as mentioned above. Anchovy-Onion Focaccia:Top with onions slow-cooked in olive oil or bacon fat, a scattering of chopped anchovy fillets, and flat-leafed parsley leaves. 1 oz/ 1 Tablespoon of fresh yeast = 0.4 oz/ 1.25 teaspoon active or instant dry yeast = 0.33 oz / 1 teaspoon instant or rapid rise (bread machine) yeast. (Reference: Crust & Crumb by Peter Reinhart). This is simply the most tender focaccia I have ever had. It was not very potato-ey but there is a wonderful potato aroma to the crumb. We had the focaccia filled with Italian prosciutto and a green mixed salad. It was a great dinner. Tom actually asked me "Did you really make this yourself!" He was blown away by the texture and the flavor the focaccia offered. Soeren devoured the focaccia at lightening speed and wanted to take a sandwich to school in his lunch box the next day. Apparently everyone wanted a bite. We had the rolls the day after. I tasted half a little after they came out of the oven and they were quite good. However, the next day, I placed them in the oven to warm through again and the truth is they tasted even better. I presume the flavors were able to combine and infuse more. The cumin seeds added a wonderful pungent flavor and with some strong cheese it was another treat we loved. I already have!! I made the rolls for Thanksgiving again, this time topped with Thyme and yet again it was simply awesome. I already have plans to make a loaf using the same dough this weekend. It's easy and straightforward. Never once did I feel overwhelmed while making the challenge. I followed the recipe and was amazed how easily everything came together. Have no fear when making bread. I have to say the challenge taught me a few things. That bread is not really the same as baking a cake - where you do have to weigh everything out to perfection. Here I went with my own feeling. For example I did not use the entire 8 1/2 cups of flour as proposed in the recipe - I used about 6 and a bit. My feeling told me that the texture of the dough was OK after that amount. I also liked the idea that we were left enough room to experiment with different types of breads - loaves, rolls or focaccia. That made me more creative. The cumin seeds idea was only a minor thing but it came to me at the spur of the moment and it was brilliant. I am learning that there are so many great sides to baking. The group is allowing me to discover so many hidden facets in me I did not even know existed! Tanna, you are gorgeous and amazing. I thank you for daring us to make this challenge. I also really thank you for going out of your way and explaining every detail, answering every question on the DB blog and giving fantastic instructions. All that made me a little less fearful and more of an optimist! You'll be seeing a lot of Tender Potato Bread variations today and if you feel encouraged to bake your own bread this is the perfect way to start. Please do check out some of my other talented and daring colleagues over at the Daring Baker blogroll. We've grown to more than 400! Check out my other Daring Baker challenges on the left sidebar under "A Proud Daring Baker". You'll find each challenge listed chronologically in the index. Have fun browsing! 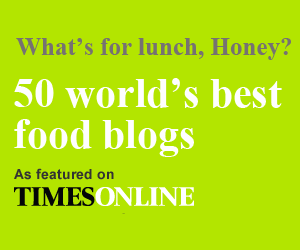 Your focaccia and bread rolls look incredibly yummy, Meeta. The focaccia looks beautiful! Once again the Daring Bakers have presented such an interesting challenge. The focaccia looks yum. I wish I'd had a chance to make some too, but only had time to try out the basic recipe. Maybe after the Christmas rush, I'll have another go..
Meeta That bread looks so delicious!! Even simple things through your eyes looks so fascinating! !I will definitely try this recipe of yours!! Well done Meeta! 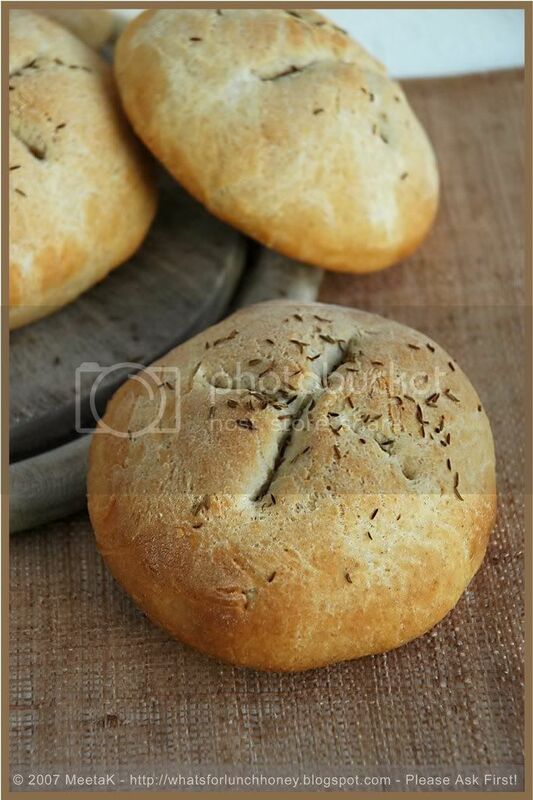 !Both the focaccia and the rolls look great...I too loved the focaccia a lot...can't wait to make it again. 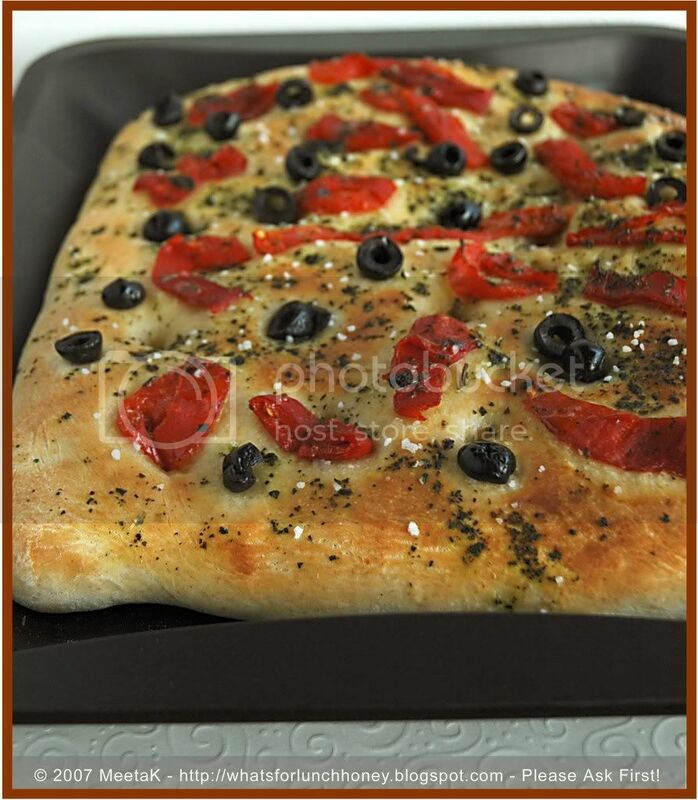 Your foccacia is beautiful Meeta! Looks so scrumptious! Funny isn't it how those baking fears don't just go away once you become a Daring Baker! Great job Meeta, which Type of German flour and which brand did you use. What was your sort of potatoes? 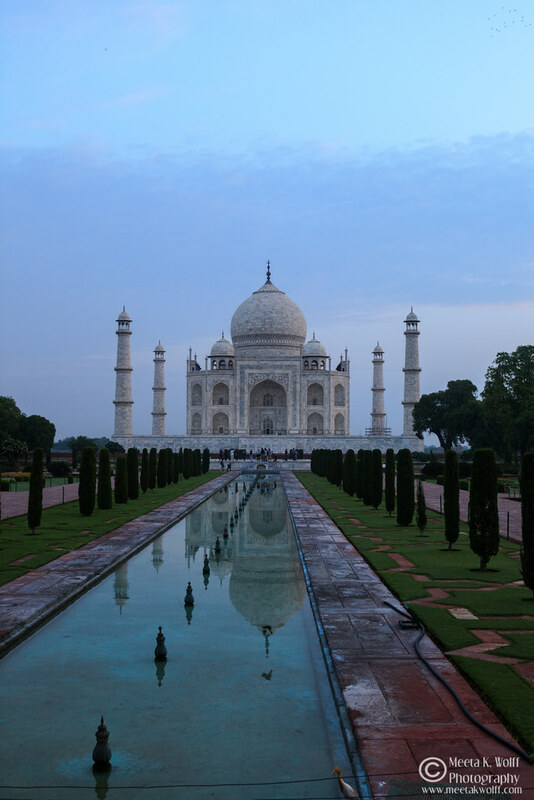 Meeta, your photos are lovely as always! The focaccia and the rolls look very yummy and I'm so sad I wasn't able to taste mine. Meeta, I've been enjoying your posts on German breads so I was excited to see what you would do with this month's challenge. Great job on your bread and the focaccia looks wonderfully tender! Well, for someone who did not have time, your breads look great and your post is very detailed !! Bravo ! 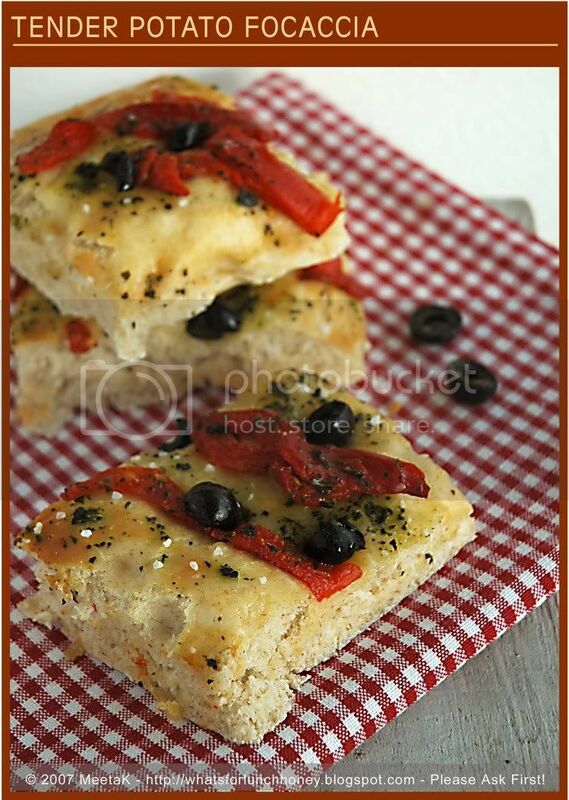 Focaccia looks yumm especially with the peppers in them..Love the dash of colour they bring out to the entire look.. I had fun kneading and punching the sticky dough too! I had the same problem this time around...I was very last minute this time and made mine just this past weekend. I was going to make focacia but I decided to keep it simple. Yours look wonderful and hurray for making it again for thanksgiving! Superb Meeta, you make me want to bake this right away, with those wonderful words of encouragement! The photos are so pretty Meeta! Brava! Your breads look gorgeous! I particularly love that fantastic focaccia! I'm doing mine over and trying your foccacia topping. Great job! 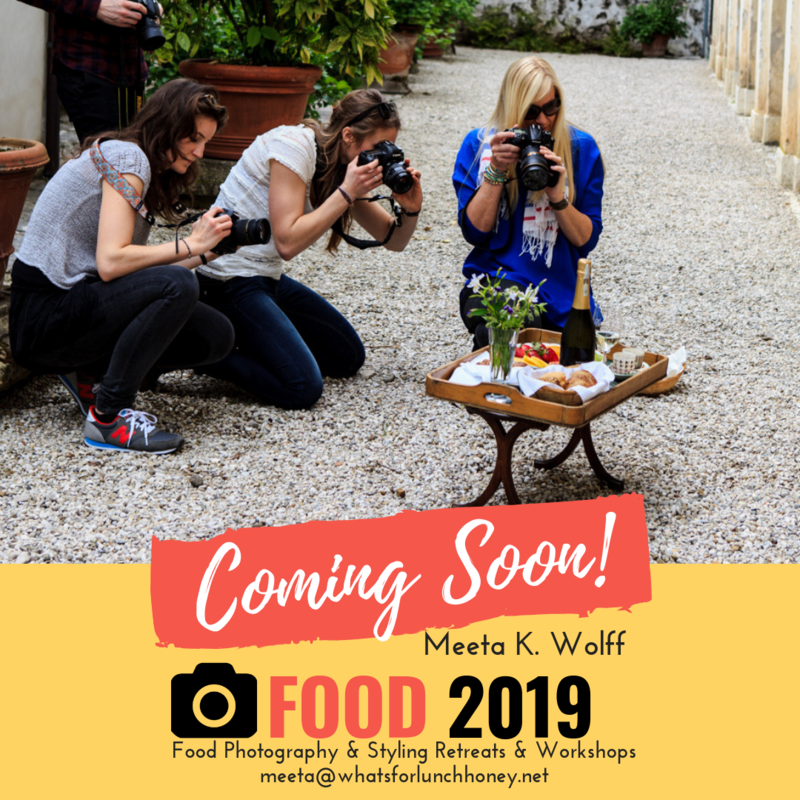 What lovely photos, and that foccacia looks scrumptious! Absolutely gorgeous. We enjoyed the focaccia also. I love your little rolls too. Your focaccia came out perfect! So yummy-looking :) I agree...bread-baking is a great stress reliever! Your photos always make me want to get back in the kitchen and make it all over again! Your focaccia looks wonderful Meeta. I think I would like to be sitting in the sun and having a glass of wine and a piece of your bread. It looks wonderful. I could almost taste it through the computer. Excellent choice of add ins! Meeta, your focaccia looks wonderful. Love the contrasting colour of toppings you chose. Such lovely foccacia, Meeta! Your photos are always so fantastic. I agree that the aroma of potatoes was noticeable, but not necessarily in the flavor. Still, as you said, the bread was delicious. Gosh Meeta I feel like a magician (blushing with a very large head) after reading your post! But I am thrilled that you stretched so far and are probably now embarked on a long glorious road to explore bread. It is so much better than a shrink. Rarely do I let my KitchenAid do the kneading. Your focaccia looks totally divine! You really took this one for a great run! that creation of yours looks fabulous!! I've been pining recently for German bakeries Meeta so I enjoyed this challenge too. But I would enjoy it a lot more if I lived closer to you and your foccacia! I so wish I could have a hunk of that! Good job on the challenge, Meeta! I love bread making for the same reasons: I can play around without worrying about measurements too much, and it is a great stress reliever and arm workout! The focaccia looks wonderful in red! I love your foccacia. Now that I see it, I 'm thinking I should have made one too. What stunning foccacia bread Meeta...colors really stick out. 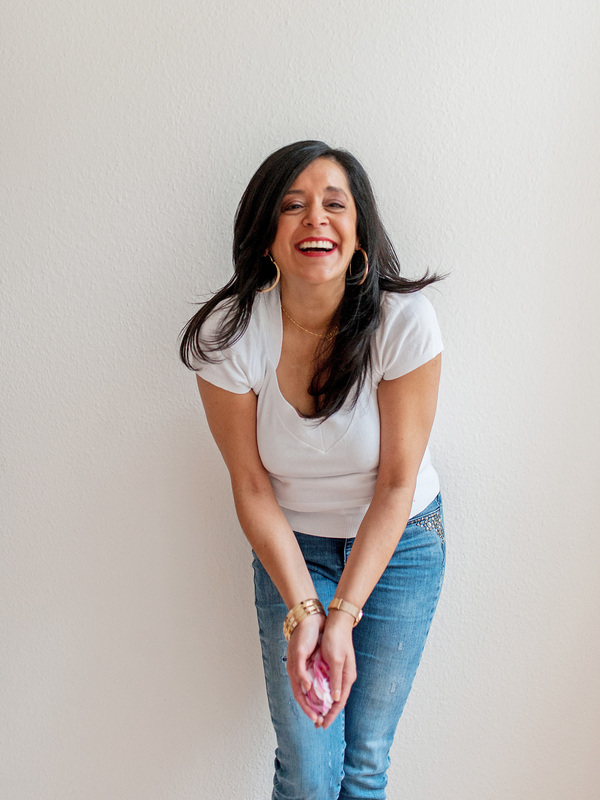 Sweet success Meeta! Your breads look just delectable!! Your photos are gorgeous, as always! I would have never guessed that you didn't make your own bread all of the time! Your work is gorgeous, and I always enjoy reading your posts. I think I will try what you've done - cumin seeds and cheese. Feel free to see my tender potato bread here. WOW! That focaccia looks absolutely drool worthy. Oh my. And the rolls look fab too! I loved this recipe as well and made it 2 days in a row. It is a keeper! i use potato in a lot of breads. it gives a tender crumb. i also add it to naan and pizza dough sometimes. your rolls look wonderful. The only thing you have to fear is that the next time you make this I'm going to come over and EAT IT ALL MYSELF! I love that Soeren wanted some for his lunch box ... that is so cute! Gorgeous focaccia! This looks like it was a great challenge. Meeta, The foccacia looks yummy, but the rolls with cumin are brilliant. We really are lucky as a group that we help and encourage each other...no fears necessary. Isn't it good to know that you can go with your instincts during bread making and be so successful? Just fabulous. The photos and the end results. Your focaccia looks divine. Truly yum! Well done! I must try the potato bread in a focaccia shape next time. Many a times I prefer focaccia to pizzas. They are tasty and go well with almost anything. These are delicious. Way to go girl! (Love the red checkered tea towel as well btw). Kneading bread makes you feel at peace with the world around. Let's tell our world leaders this! It all looks fantastic Meeta. Glad I wasn't the only one who struggled to get it made in time. Looks like you were well ahead though. I loved the focaccia best but the loaf and rolls are pretty good too. Your focaccia looks absolutely amazing! So pretty and colorful. Wonderful job, Meeta! *wow*! That focaccia is to-die-for! I skipped that in favor of the rolls and loaf, but I can't wait to try this out again soon! I definitely have to try this as a foccacia, too! I've made one the other day and wasn't very pleased with the outcome. Yours looks lovely, though! *droolss* my goodness, that focaccia just looks sooo good, congratulations on your challenge! This recipe sure did take a while, no? The foccacia looks delicious and I cannot believe that you already made it twice! Wow! I'm so glad that you found time to complete this month's DB challenge - your rendition of the potato bread sounds/looks spectacular!! And how fun that you've already tried the recipe out AGAIN - it's always fun to find new "go-to" recipes. Great choice of toppings for your focaccia! 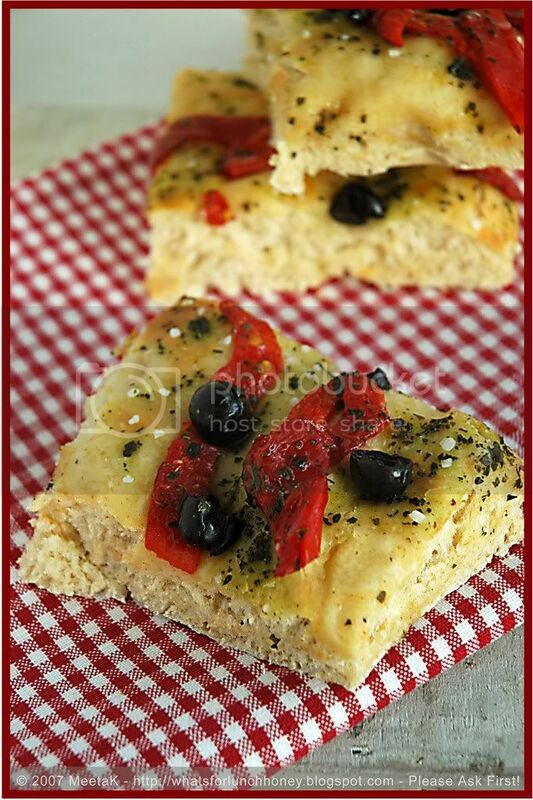 That opening picture is simply stunning....lovely looking focaccia, Meeta! Your focaccia is beautiful and colorful! And I'm with you, kneading bread is great therapy! Wow Meeta! Stunning pictures as always. That foccacia is incredible. wow such perfect little rolls! and the focaccia looks absolutely divine. excellent work, as always, with this challenge! Sorry for the late reply to all your awesome comments - I was in Berlin all of yesterday! WOW! I really appreciate all this motivations a feedback. Thanks everyone. Ulrike, I used the both types of flour from Alnatura which you can get at DM or Teegut. The potatoes were also the "Mehlig" type from Teegut - brand Demeter. Ivonne - if you promise to come over - I promise to make an extra focaccia just for YOU! Once again hugs to you all for your great comments! The cumin seeds are pure brilliance- I am so stealing that idea! The rolls just look gorgeous with them and cumin is divine, for sure. Great job! Congrats on conquering bread in style, Meeta! Everything looks delicious, and that cumin seed variety certainly looks intriguing. And having made the bread three times means someone is getting the bread bug, welcome to the club! Great job! Your focaccia does, indeed, look store-bought perfect (but better). I hear you about needing to devote a day to the bread, though - I was short on time and it was all a bit rushed, but I'd really like to do it again with a whole day to make things calm and collected (ha!). Beautiful Meeta - that looks delicious!! Yum!! Your focaccia looks yummy!! That is a mouth watering focaccia, not to mention so pretty with all the colors in it. I am glad you found the time to fit it in your schedule. I know how hard it can be to get these challenges done. Oh, you did such a wonderful job with your bread! I love how you decorated the top of your focaccia. I love your focaccia and you, single handedly, have made me decide that I will make focaccia myself! Yay! It would have been sad if you had not made the challenge this month, so I am glad you did make it! Once again thanks for your great comments. Hugs to you all! Your focaccia looks fabulous Meeta. I'm so glad I finally got here... I love reading your thoughts on our monthly challenges. I've been wanting to make this bread ever since you first posted this recipe a year ago. But never got around to doing it till now. It was my first time baking bread ever and while they came out ok, they don't look anything like yours. I made just rolls, followed ur instructions to the T, but I had a few problems - the dough was way too sticky, no matter how much flour I added (perhaps this was because I had too much potato - not sure why). Even though my dough rose beautifully, my rolls came out much flatter than yours - I wonder how you got yours to come out so beautifully shaped and fluffed. In the end though, they weren't bad. I love the texture of the crumb and the crusts. But (probably because of all the extra flour I added) my rolls were a bit lacking in the salt department. But I liked them enough that I think I will try these again. Now, I just have to go and get some bread for my guests tomorrow, coz I just can't bear to serve my misshapen rolls (flats!). Thanks for sharing the recipe and your experience.